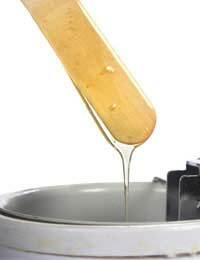 Waxing can be a great form of hair removal for a number of reasons. It’s quick and easy, there is rarely any unsightly stubble left behind, and normally hair regrowth won’t occur for four to six weeks – or more. But while it may sound like the perfect solution for unwanted hair, waxing is not the perfect method for everyone. Additionally, waxing might work well for you on one part of your body, but be a disaster somewhere else. Side effects of waxing are common, but you can learn how to deal with them effectively, instead of giving up on waxing altogether. Some people find that their legs respond well to waxing, while their bikini area breaks out in spots. It’s all a question of trial and error. Spots. Pimples are common after waxing, usually appearing a day or two after the deed’s been done. Minimise an outbreak of spots by cleansing well before and exfoliating after. Also, take care not to double dip with wax: apply wax only once to an applicator, then dispose of it. Make sure your salon follows the same basic hygiene rules to avoid spreading bacteria. Redness. This is inevitable for some people, although usually the redness disappears quickly. Avoid going in the sun for at least 24 hours after a waxing session to minimise redness altogether. Itching. Making sure you exfoliate before and after and applying a suitable moisturiser should take care of this problem. As your pores may still be open, avoid any perfumed moisturisers. A hypoallergenic one is ideal. Applying aloe vera or witch hazel afterwards can also help calm the area. If you have diabetes. People with diabetes can be much more susceptible to infection than others. Ask your GP if you are concerned, and avoid waxing completely on the leg area if you have any diabetes-related foot or leg condition. If you are taking certain acne medications. Taking acne medications such as Tretinoin and Accutane can be dangerous if waxing, and good salons will not allow people on such medications to have any waxing treatments at all. Keep in mind that acne medication can stay in your system for three months to a year after you stop using it. If you have a bad sunburn. Wait until it clears up completely, or you – and your skin – may regret having that wax. If you have lots of moles. Ask your dermatologist or GP first and never wax over a mole that is raised. If you are in between laser hair removal treatments. Waxing in between can interfere with laser hair removal. When you are menstruating. Many women are much more sensitive to pain when they are menstruating. It might be a good idea to wait about a week after your period ends before waxing. Waxing, for many men and women, is the preferred alternative to shaving and plucking when it comes to temporary hair removal. While some side effects are common, many people find that if they take the proper precautions they can minimise or get rid of them altogether.